Scientists have been able to detect prostate cancer with 90-95% specificity. According to Dr. Huo, this means “if an individual tests positive with our test, there is a 90-95% likelihood of him having prostate cancer. 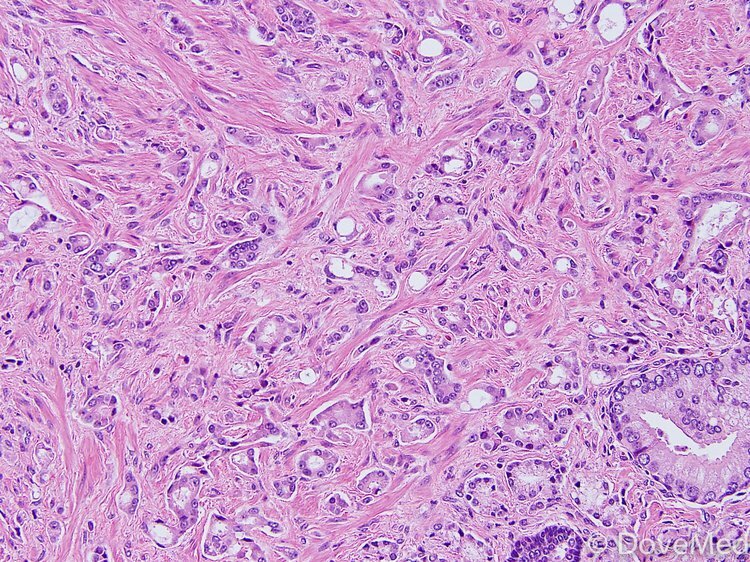 This is a microscopic pathology image showing adenocarcinoma of the prostate. (Prostate cancer). Nanotechnology allows scientists to manipulate individual atoms and molecules. DoveMed has previously reported on the application of this technology in medicine. Using nanotechnology in combination with computer tomography (CT), Dr. Popovtzer and colleagues were able to detect early-stage head and neck cancer, in a demonstration of proof of concept. It has been reported that when an individual develops cancer, an immunogenic response produces antibodies targeting abnormal glycoproteins that are formed by tumors. These autoantibodies have been found in the blood for many types of cancer and are often called one of the “biomarkers” of cancer. Efforts have been made by many laboratories to use these biomarkers for early detection of cancer. It is well known that early detection offers many advantages including better treatment options and better success rates, particularly for breast, ovary, and prostate cancer. In contrast, the current screening test using PSA levels is far less sensitive and specific. In fact, there is sufficient ambiguity that in many situations, this test leads to several unnecessary tests and procedures. · This test could potentially be used for many different types of cancer, as the antibodies found in response to cancer occur in a number of cancer types. Early detection of cancer is one of the objectives of nanotechnology in medicine. Dr. Huo’s research potentially puts that goal well within reach.